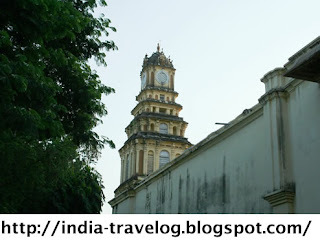 Madurai is the oldest and second largest city in Tamil Nadu. 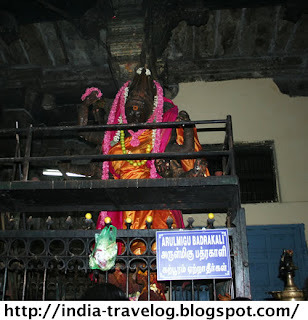 It is located on Vaigai River and is popular for its rich cultural heritage, which is more than 2500 years old. The prime attraction in Madurai is the Meenakshi Temple – The temple can be identified from a long distance because of its 12 magnificienly painted gopurams. There are two sacred sanctuaries in the temple – one dedicated to Goddess Meenakshi and one to Lord Sundareswar (Shiva). There is also the famed “Hall of a Thousand Pillars” in the temple that is adorned with around 985 ornately carved pillars. It is said that each pillar when struck produces a different musical note. 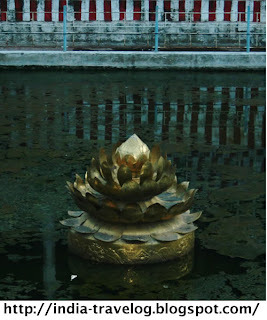 I did not try this out though.There is also a pond inside the temple called the Potramarai Kulam (The Golden Lotus Pond). There are numerous stalls lining the path leading to the temple entrance. These colorful shops sell pooja items, pictures of deities, ornamental stuff and flowers and fruits. 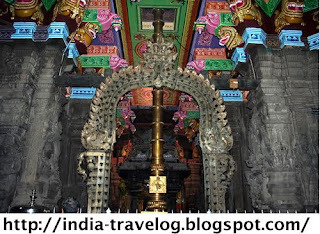 Another major attraction in Madurai is the Tirumala Naicker Mahal. This Mahal was built by King Thirumalai Naicker the seventh ruler of the Madurai Naick dynasty. He commissioned an Italian Architect for building the Mahal. 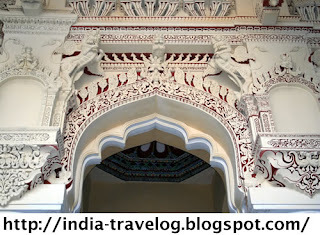 The architecture is a blend of Dravidian, Islamic and European styles. The palace has two sections called Swargavilasa and Rangavilasa. The original palace structure was almost four times bigger than what remains today. 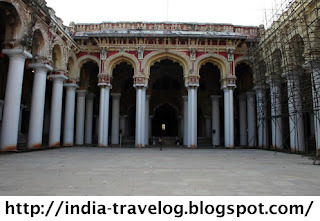 The Palace is now under the protection of the Tamil Nadu Archaeological Department. Visitors are allowed into the palace from 9 a.m. to 5 p.m.
Situate around 5 kms from the Meenakshi temple is the Vandiyur Teppakulam – This temple tank is one of the largest one in South India and has a Mandapam at the center surrounded by four small mandapams. Water is supplied from the Vaigai River by underground channels. The float festival of Madurai is celebrated in this place. Thirupparankundram Temple, located 8 Kms south of Madurai Railway Junction is one of the six abodes of Lord Subramanya(Murugan). Its innermost shrine is cut out of a solid rock. One of the other attractions in Madurai is the local flower market, which is supposed to be one of the biggest flower markets in India. The flowers traded in the market are different varieties of jasmine, rose, crosandra, marigold, lotus and tuberose. TRAVEL TIP: The auto fellows are out to fleece you. They quote whatever they feel like. So fix on a fare before you board the auto. Or you could be adventurous and try the local buses. Another mode of transport would be the cycle rickshaw. But fix upon the fare even for this.